Enter into the world of fashion where anything and everything can be considered art, if presented correctly and at an appropriate time. Clothes are no longer seen as just attire, but a fashion statement. Moreover, ccessories have become a rage and complete an outfit. 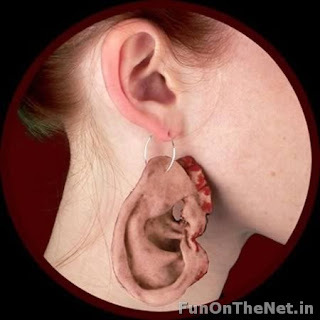 Without further ado, below is a list of the top 10 most bizarre earrings. Do you want to be more attentive and doubly sure to events going on around you? 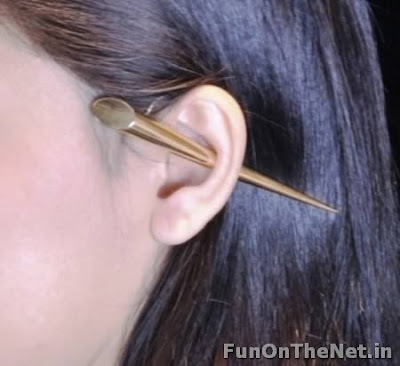 Now you can afford to have another set of ears attached your existing ears. With these bizarre earrings in your ears, people around you are definitely going to be more careful while spreading rumors about you! Designed by Marco Rigovacca, these earrings give the illusion that someone has driven a spike through the ear. In reality, there’s actually a thin gold loop that connects the two segments of these earrings. Fed-up with all the existing medications available in the world for the common cold? Then try this novel one. These earrings have got two tiny blue and white bowls resting on equally miniature plates. Each bowl contains noodles, bits of chicken, carrots and celery in broth which is a perfect remedy for cold. 3 little saltine crackers are placed on the plate. If this much is not adequate for your diet, then you can wear multiple numbers. If you’re in the habit of chewing gums and fancy a change then these earrings will provide you with a solution. Each earring has delicious gummy candies in miniature glass jars. These piranha plant earrings are for the child in you. They have been designed by the Etsy seller Elizabeth Kohn and resemble the piranha plants from Super Mario Bros.
Feelings down and beaten by the dark forces around you? Designed to look like minuscule blub these are the earrings that will surely light up your life. These peculiar squirrel feet earrings are for those who wish to show off that they have nimble feet. You can escape any uncomfortable situation with the help of these earrings. For those tech-savvy individuals out there, these are a must have for you. Display your love for trendy gadgets by donning a pair of these ipod earrings. These new set of thermometer earrings are designed exclusively for those people who want to be constantly up to date with the weather conditions. After wearing these, one does not need to look at the weather forecast portion of the TV news! Here is a new technique for carrying pictures of your icons. A supporter of U.S. Senate Majority Leader Harry Reid (D-NV) was caught wearing Chuck Norris earrings during a campaign event at the Searchlight Nugget Casino in Searchlight, Nevada.